**I received a copy of this book from Litfuse Publicity Group. All thoughts are 100% my own. If someone gave you this piece of parenting advice, what would you think? Chances are you'd think they were pretty crazy, right? I mean, that sounds like awful advice. Never say no? How will our kids learn boundaries? How will they learn how to overcome challenges? How will they learn that they are not the center of the universe? Never say no sounds like just the advice that would lead to a generation of spoiled kids who always get their way. Not the advice of parents raising Godly children who put others before themselves. And yet, when asked the question, "How did you raise your kids?" this is just the answer that Mark and Jan Foreman- parents of Switchfoot's Jon and Tim Foreman- gave. And this is the topic they discuss in their new book, Never Say No. If you hadn't figured out from the description, this is not a book about not setting boundaries for your children. It is not a book about giving them every little thing they ask for. It's not a guide to raising children who never hear the word no. 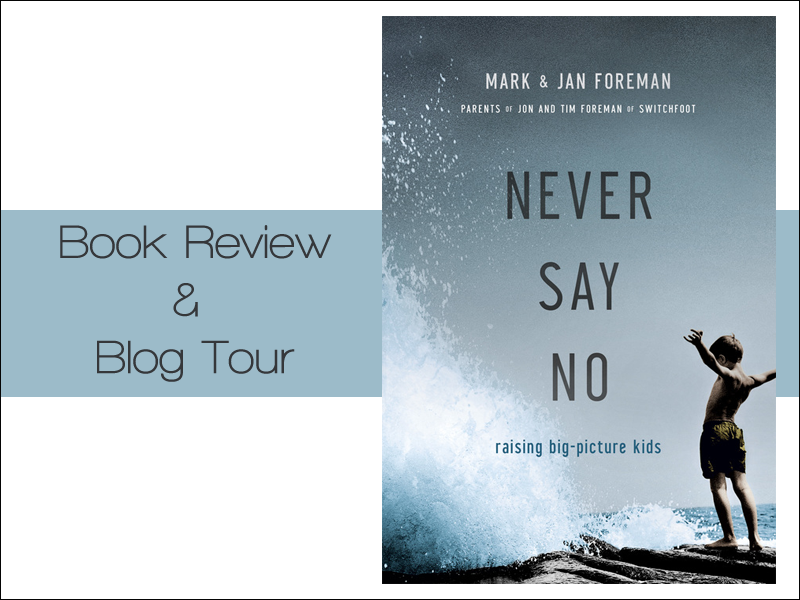 Instead, its a book that encourages us to never say no to encouraging our children. To raise children who have passion, interests and who believe that they can accomplish anything. To raise children who are about more than themselves. This is truly a wonderful book for all parents to read featuring great inspiration for raising big picture kids, questions to ponder and so much more. But beyond that, it is also a truly wonderful story about a family. Though I took a lot away from it to inspire my parenting, more than anything I felt it was a wonderful glimpse into the life of this family. It was less of a how-to, and more of a how-we-did. Inspiring, entertaining and truly a great read for all parents. Want more reviews? Check them out here as part of the Litfuse Blog Tour! This sounds like an interesting read, I'll check it out! I think this sounds like a great read!! Great parenting tips, it takes time to think about their parenting style! Did you know that you can create short links with Shortest and earn $$$ from every visit to your short links.